The First 24 is a stylish racer and a fast cruiser, an unparalleled compromise in the category of high-performance, transportable, cruising yachts. Ideal for racing with a crew of four, it can accommodate six on a coastal cruise, and eight on day trips. The First 24, designed by Sam Manuard is a high-performance thoroughbred with a boldly modern hard-chine hull. Most of the standing rigging is led back to the clutches located on the companionway and two winches combined with jammers making trimming child's play. The First 24 performs particularly well in light and medium air, progressing moderately and with ease at speeds of 15 knots. The combination of the First 24's light weight (960 kg) and lifting keel, means she can be towed by car and launched easily from a slipway. With a masting kit, the yacht is ready to sail in under two hours. For family crews, the First 24 can be fitted with high guardrails (45 cm) and a bow pulpit. A foam-filled forward triangle also means that she cannot sink. 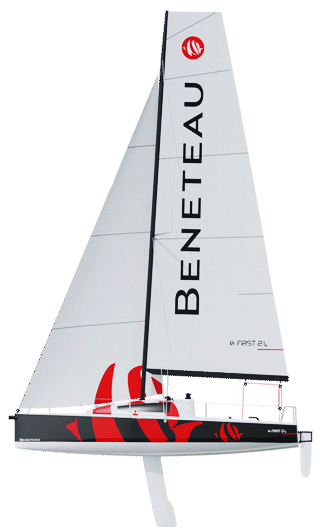 With the carbon rigging and the lowered 1.9 m keel, the First 24 can be perfectly controlled with a small crew or solo. Four canvas bags can be used as shelves and travel bags, making boarding and storage on board much simpler.